Sony Ericsson's Kurara - real? 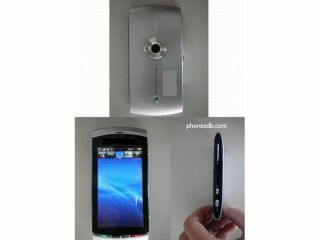 The rumoured Sony Ericsson Kurara looks set to debut in 2010 after new photos of the phone leaked onto the internet. Reported two weeks ago, the Kurara will apparently have a similar spec list to that rumoured: 8MP camera and running the Symbian S60 interface. This would position the phone nicely between the Satio and the Aino in the current product list, bringing smartphone capabilities to a more budget handset. Well, perhaps cheaper, as the photos from PhonesDB show the Kurara packing a full HD camera, like that used on the Samsung i8910HD, meaning recording video that won't look totally shocking on a TV screen. Of course, it could just be a fairly decent Photoshop effort, but the 3.5-inch OLED screen looks pretty tasty, and we're enjoying that curved design too. If it does turn out to be real, then it will likely be later in 2010 and will be called something less interesting like the Xperia Wellness XUX 901. Or Jeff.